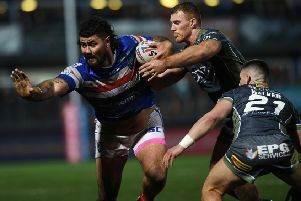 The Wakefield Express has teamed up with First Utility, official sponsor of the Super League, to offer three lucky fans the chance to win a pair of tickets to Wakefield Trinity Wildcats’ clash with Catalans Dragons at Belle Vue on Sunday, March 6. Wakefield boss Brian Smith will be hoping his side can put on a good show in front of the Belle Vue faithful. Can the Wildcats slay the Dragons? You could be there to watch all the action live. For your chance to win, simply answer this question. Who is the current head coach of the Catalans Dragons? To enter the competition, simply email your answer to sport@wakefieldexpress.co.uk before the closing date of Tuesday, March 1. Please include your name, address and contact telephone number. First Utility is a different kind of energy company that saves you money and puts you in control. It will also be rewarding fans of the First Utility Super League this season with customer rewards such as exclusive training sessions and merchandise. For more information visit www.first-utility.com. 1. The prize consists of two tickets to the home game against Catalans Dragons for three winners. 2. The package does not include travel to or from the ground or any hospitality at the ground. 3. Entrants are reminded that tickets are issued subject to Wakefield Wildcats regulations and the Conditions of Entry relevant to those tickets. 4. Competition open to all UK residents with the exception of employees of First Utility, Wakefield Wildcats, or Hatch Communications, their immediate families, agents or anyone else associated with the administration. 5. No cash alternative will be offered. 6. The competition closes on Tuesday, March 1. 7. In the event of unforeseen circumstances, the promoter reserves the right to offer an alternative prize of equal or greater value. 8. The promoter’s decision is final and no correspondence will be entered into. 9. All entrants must be willing to participate in publicity should they be a winner. 10. We reserve the right at any time to cancel, modify or supersede the competition if, in our sole discretion, the competition is not capable of being conducted as specified in the competition rules.